Lisa Dolan, Vice President of Supply Chain Strategy at ALOM, a global leader in supply chain management, has been named the 2019 Supply Chain Pro to Know of the Year by Supply & Demand Chain Executive. 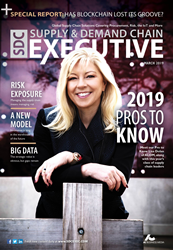 This award honors her as the premier supply chain executive amongst all those recognized in the 19th annual 2019 SDCE Pros to Know Awards; a list of best-in-class supply chain practitioners and providers who enable their supply chain to meet the significant challenges of today’s global business climate. “Being selected as Pro of the Year by SDCE is a high honor that I accept on behalf of the entire global team of ALOM supply chain professionals whose talent and dedication make our customers’ growth and success possible. I am passionate about applying technology to solve complex challenges that delivers truly exceptional supply chain performance to our customers. With all its moving parts and global impact, I can’t imagine a more exciting and important industry to have dedicated my career,” Dolan said. Dolan positions ALOM customers for supply chain success amidst an increasingly complex and fast-changing technology landscape and global trade environment. For example, she strategizes with customers and systems engineers to utilize technology to produce and deliver products and information globally while protecting the supply chain from disruption; specifically in the areas of ecommerce fulfillment and automotive system data management. A leader in her profession, a contributor to her community, and a role model for women and girls, Dolan’s impressive track record has recently earned her the 2018 Connected World Women of M2M/IoT award, 2016 YWCA Tribute to Women Award, and the 2016 Women in Manufacturing STEP Ahead Award. This award follows a string of recent accolades for ALOM recognizing excellence in supply chain sustainability, partnership, technology innovation, and supplier diversity. For example, Dolan and ALOM President and CEO Hannah Kain each were named to the overall list of 2019 Supply Chain Pros to Know, from which Dolan was named the Pro to Know of the Year.